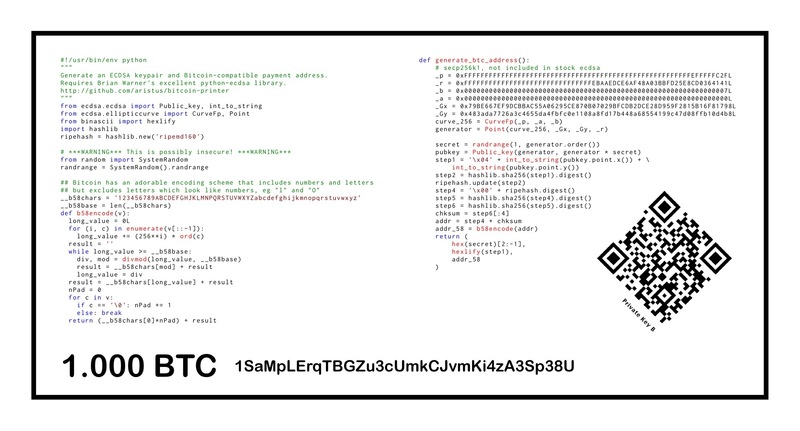 What a bitcoin actually looks like from a programmer's perspective. No shiny metals at all. This is a belated follow up to a previous post on bitcoins. To be fair, I wrote that previous post before reading this excellent article arguing, persuasively, that an alternative currency is the least interesting thing that bitcoin is trying to be. Even so, it is hard for me to see a future for bitcoin itself, because while many of the things you can do with bitcoin are really cool, to access these functions you still have to use bitcoin the currency, which is highly volatile and prone to speculation. On twitter Jorge Ortiz reminds me that in fact, the earliest developers and adopters of bitcoin are sitting on the largest stockpiles, which is to say that starting your own cryptocurrency is exceedingly profitable. This gets at, I think, the core reason that bitcoin--and all other currencies that lack the backing of a strong central government--are doomed. The bitcoin developers thought they could produce a currency with a stable value merely by 1) making it costly to produce and 2)capping the total number of bitcoins that will ever be produced. This reflects a view of monetary economics that most non-economists share: a hazy understanding of the quantity theory of money (ignoring, of course, the fact that the money demand curve shifts) and a belief in what Greg Mankiw calls "the inflation fallacy"--the idea that inflation decreases everyone's purchasing power. The inflation fallacy is beyond the scope of this post, but let's just assume that price instability--inflation or deflation--is bad. As noted earlier, the distribution of bitcoins proves that there's immense profit in starting your own cryptocurrency. That means that the market for currencies is prone to new entrants--Dogecoin, for example, has already soared passed bitcoin and boasts twice as many transactions on a regular basis. As people substitute bitcoins for Dogecoins, the money demand curve for bitcoins shifts to the left. Because the bitcoin founders decided to make the supply of bitcoins fixed, this implies massive inflation in the bitcoin economy--the same amount of currency in the hands of fewer people means higher prices. And of course, if bitcoin's competitor also persues a Randian monetary policy with fixed money supply, they don't perform any better: an influx of people substituting to dogecoin from bitcoin causes dogecoin demand to rise and, in the absence of a corresponding increase in the quantity of dogecoins, causes massive deflation. Deflation is, if anything, more insidious than inflation. But that's not the worst of it. A big part of the problem here is that private currencies carry with them a strong incentive for the founders to levy seigniorage revenue. And despite the Randian policy of bitcoin, the distribution of bitcoins shows this is exactly what has happened--the founders of the currency made boatloads of money simply by "printing" bitcoins. While they have promised to eventually stop earning seignorage revenue, in general the founders of a cryptocurrency needn't honor such a commitment--they are free to print as much cryptocurrency as they wish. Therefore, I would suggest that the long-run equilibrium in the private-sector crypto-currency market will be one in which inflation is whatever rate maximizes the seigniorage revenue of the currency's founders. We've seen this happen a lot in private sector currencies, actually--just look at all the frequent flier miles programs. I have no idea whether such a high inflation rate is socially optimal, but it is quite clear that that would be much higher than the inflation rates american society is politically comfortable with. This highlights a critical distinction that I think is missing in discussions of bitcoin and other cryptocurrencies. They aren't like the gold standard. They are the dead opposite of the gold standard because they aren't backed by any commodity at all. They are 100% fiat currency, backed by faith alone. Even the US dollar looks like the gold standard in comparison to bitcoin: the dollar, at least, is backed by US treasury bonds and considerable institutional power, while bitcoin is backed by nothing at all. In short, I think the bitcoin project is doomed. I think all private-sector cryptocurrencies are doomed--at least in the United States--because they can't deliver the promise of price stability nearly as effectively as a government institution. To maintain stable prices a currency must have the ability to adjust the quantity of money in response to shocks in money demand--the Fed can credibly do this, while cryptocurrencies can't. In fact, the Fed's control over the money supply means that it can guarantee the dollar's stability even in the face of "disruptive" new entrants, while cryptocurrencies like bitcoin cannot. But none of this is meant to disparage the technical achievements of the bitcoin founders. Duardo points out a lot of interesting and awsome capabilities that bitcoins have, and I expect that--or perhaps merely hope that--the Treasury will eventually convert the US dollar into a cryptocurrency with all the functionality of bitcoin, but with the institutional backing and management of the US Treasury and Federal Reserve.